Jose Mourinho issued a remarkable come and get me plea to Premier League sides last night after seeing hisReal Madrid side beat Sevilla 1-0 victory in the Copa del Rey semi-final first leg last night. I cannot remember a coach, especially one as high profile as Mourinho issuing a come and get me plea to other teams. Players do it all the time, but you never hear managers make this statement. But there is one problem for Mourinho. The three teams he identified all have managers. While I believe that Mourinho would be perfect at Old Trafford (and that this is the job he really wants) it does not look like Sir Alex is going anywhere soon, so the Man United job is not opening up in the next year or so. Across Manchester, Roberto Mancini has recovered from a poor start and looks firmly in control at Eastlands. Othjer than a collapse that sees City drop out of a Champions League spot I expect Mancini to be back at City next season. That leaves Chelsea and Carlo Ancelotti. Ancelotti has been frustrated this season with all the behind the scenes activity at Chelsea. From losing Ray Wilkins to Chelsea making offers on players that he was not aware off, it has been a difficult year for Ancelotti. It would not surprise me to see Ancelotti leave Chelsea at the end of the season. But would Mourinho go back to Chelsea? I woud be shocked if he did. Mourinho’s career has always been about chasing the next challenge. he has already won everything domestically at Chelsea and I cannot see the challenge for him to go back and manage the Blues. Plus all the reasons why he left (the behind the scenes stuff) are still in play at Chelsea as Ancelotti knows. So where does that leave Mourinho? I believe that his preferred destination is Old Trafford. He is one of the few managers big enough to take over from Fergie. But as I said, that job is not opening up anytime soon. Two other clubs that are big enough for Mourinho are Liverpool and Spurs. Liverpool have Dalglish as an interim manager through the end of the season, and the possibility of getting Mourinho would have to interest Liverpool’s U.S. owners. The second possibility is Spurs. If Capello leaves the England job after the 2012 Euro’s, then Harry Redknapp is the favourite to take over as England boss. 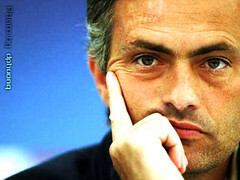 That creates an opening at Spurs for Mourinho and I believe that is where he will end up in 18 months.